"Sung almost exclusively in Spanish and is expertly filtered through a Mexican and Mexican-American cultural prism"
"Shakes, rattles and rolls with enough passion and infectious verve to fuel several dance marathons"
"Los Straitjackets’ Rock En Espanol (Yep Roc) puts some Spanish flavor into vintage R&B and doo-wop, with Cesar Rosas and Little Willie G., putting some soul into their versions of 'Poison Ivy,' 'Gimme Little Sign' and 'Anna' among others." "But they also dip into some more contemporary rock items with stirring renditions of 'All Day and All Of The Night' and 'Wild Thing,' plus more novelty fare with a great cover of 'Bony Maronie.' Don’t let a lack of fluency in Spanish prevent you from enjoying the tunes on Rock En Espanol, because their presentation and performances communicate the essence of classics like 'Slow Down,' 'You’ll Lose A Good Thing” and “Dizzy Miss Lizzy” (all songs also listed on the CD in Spanish). While both the Nashville Scene and the Nashville City Paper recommend Los Straitjacket's performance and new album, the Oregon-based BendWeekly.com gave the new album a more lengthy review, and glowing praise, here. "...they create an ebullient tribute to vintage rock and R&B that is sung almost exclusively in Spanish and is expertly filtered through a Mexican and Mexican-American cultural prism. What results is a celebration of 'rocanrol Mexicano' that shakes, rattles and rolls with enough passion and infectious verve to fuel several dance marathons. So expect lots of frenzied, if not quite holy, gyrations when Los Straitjackets, featuring guest vocalist Big Sandy, kick off a three-month national tour..."
"...few albums this fun also boast such an intriguing history. 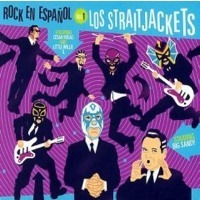 And if Los Straitjackets and Big Sandy sound even half as inspired on their joint tour as they do on this album, their tour promises to be muy caliente!" Rock En Espanol can be bought or sampled on Amazon.com here or on iTunes here. Label Yep Roc has more information here. The band's official web site is here.